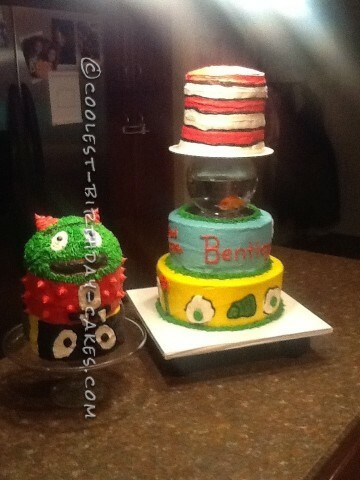 I am so glad to have at least a little talent to be able to make cakes for my family. I made these cakes for our grandson Bentley’s first birthday, the Yo-Gabba Gabba cake was his smash cake and the Dr. Seuss was the one for everybody else. I had been planning his birthday cake from the day he was born so in my head I had made it 100 times. I was so happy when I got finished and everyone loved it and yes, that’s a real gold fish in the bowl and he is still alive, 3 months later. The Yo Gabba Gabba cake only lasted about 20-30 seconds, Bentley was scared of all the singing and the attention so needless to say 7 hours and 12-9 in round cakes and 3 batches of butter cream later, he pushed it on the floor. I am already thinking of his next birthday cake, maybe he will he joy it more by the time he is 2.